Vinnie arrived as a stray in July 2013, a very handsome, friendly boy he was fearful of some other dogs. Time and time again Vinnie was overlooked for re-homing just because of his Staffordshire Bull Terrier looks and it seemed so unfair. Vinnie spent much of his time playing with his friend Max, another handsome wee Staffy – they’d spend hours playing tug with a rope! Max found a lovely new home at the beginning of January and Vinnie got a bit lonely so he spent his days in the office with the staff – we just loved him jumping up on our knees for a cuddle! 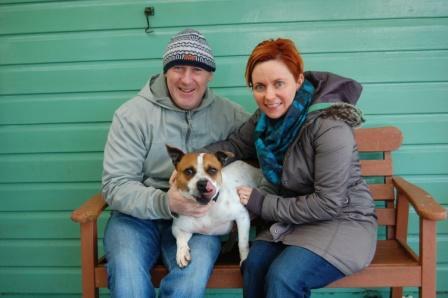 Finally after seven months of waiting along came Steven & Angie who instantly fell in love with him! Vinnie skipped down the path with them and away to his new home at the weekend and we hope that they all have many happy years together. This entry was posted in Found a Home and tagged Staffordshire Bull Terrier Crossbreed.